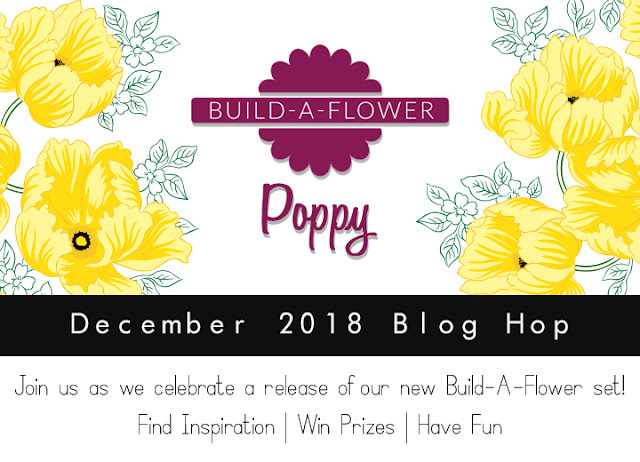 Well, it's time to share another exciting Altenew Build-A-Flower release with you. 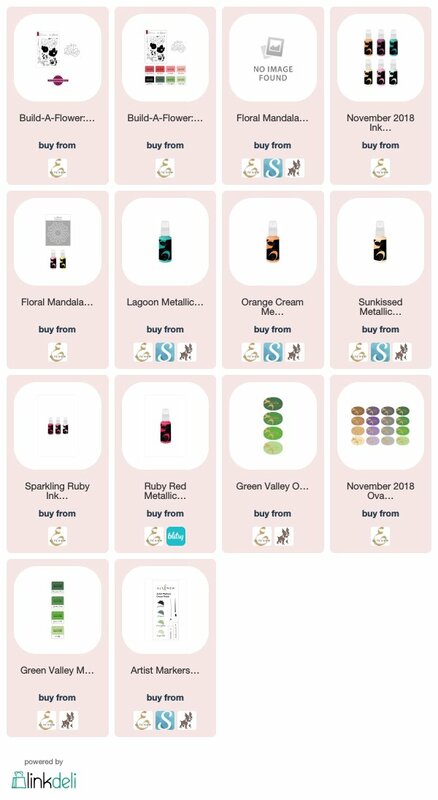 If you come from the fabulous Laurie Willison's blog, you are in the right place! For all the details about this release, please visit Altenew Card Blog. When I received this stamp set/die, I had a bit of hard time thinking of the ways in stamping the images in the best possible way...In the end, I decided to using the Orange Cream from Altenew November Ink Spray Bundle and mixed the colors with Ruby Red. With that beautiful ink-sprayed colored paper, I was able to stamp the Poppy Flower in two layers (omitting the first solid layer). I then created a a very subtle background with the new Floral Mandala Stencil. Of course, the matching die cut makes it super easy to assemble the entire card. I took out the nozzle of Lagoon Metallic Spray and carefully added the splatter! I have another completely different version with the Poppy Build-A-Flower. Please do come back as I will share it in a few days! Prizes: to celebrate this release, Altenew is giving away a $30 gift certificate to SIX lucky winners! Please leave a comment on the Altenew Card Blog for a chance to win. Three winners will be announced on the Card Blog, and other three winners will be announced on the Scrapbook Blog on Dec. 9th (my birthday!!). Giveaway: one of you who comment in this very blog post will have chance to win $20 Altenew Gift Certificate! The winner will be announced right here in this blog on Dec. 5th. 👉👉 Take the advantage of the promotion.... shipping is FREE in US (with code CRAFTY18 ) ! Not valid on prior purchases. Cannot be combined with other promo code. Your next stop is the talented Norine Borys' Blog! two monthly winners of $15 Altenew Gift Card. Such a beautiful card !! love the new BAF released this month !! Love the vibrancy of you poppies! Love the colors in your flowers. Gorgeous! I really love the use of the stencil for a background. 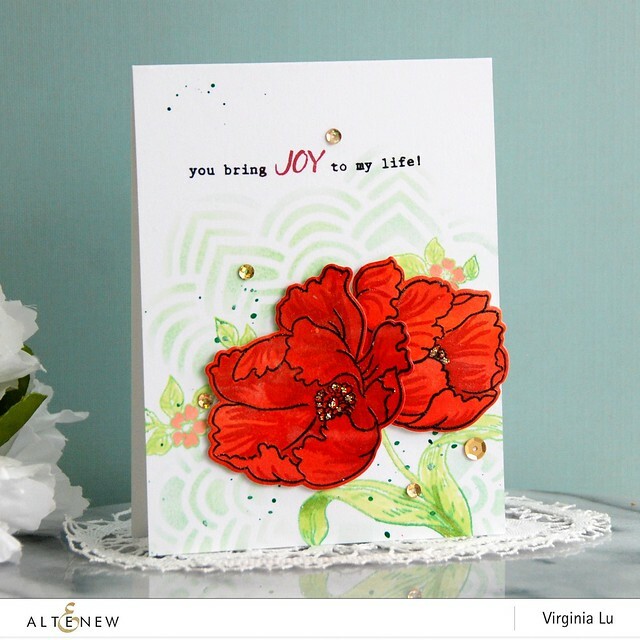 Such a beautiful poppy card, Virginia! Love this new BAF set!! Beautiful card. I love this new stamp set. Love this card design with the stencile beneath.. pretty as your usual Virginia. I really like your soft background. Lovely card! I love how bright and vibrant the poppies are, and that bit of sparkle you added in various ways! Love the vibrant colour combo with the more subtle background. Just gorgeous! I love the pretty stenciled background too!! Beautiful Virginia! I love your soft stencil background too! Lovely card! :) I really like the stenciling in the background. Gorgeous new BAF set! Love these beautiful poppies! Your card is fabulous! Altenew's floral stamps are out of this world - and this new BAF set is stunning! Oh dear! My wish list just got longer. Lovely card! Thanks for the inspiration. Love the vivid poppies! Look so pretty against the soft, subtle background. This is lovely. I like the background,too! Beautiful cards! Love this stamp set and dies! I love this new set... poppies are a favorite!!! So pretty , love the stamp set ! The stenciled background is great . I love how you made the outline on the poppies. Nice job! Beautifully done Virginia...like too that you used the stencil background! Hope you have the best birthday ever!!!! Love the vibrancy of this poppy. Since it's our state flower and since in the Spring my backyard is covered in them, I'm a bit biased. They're such a happy color and the subtle background you created is perfect for this one. Such a gorgeous flower and lvoe the background! Your card is gorgeous! My, this poppy stamp is remarkable! I had several red poppies in my garden in the past. I think the many timers I dug plants, I accidentally threw them away. 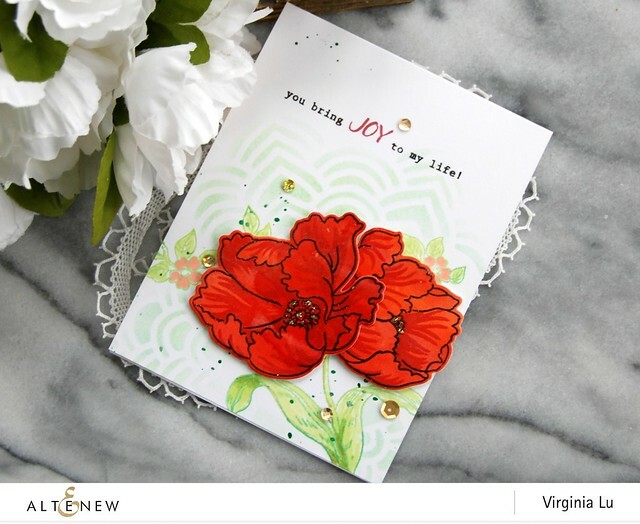 love how you used the stenciled background to really show off that beautiful poppy! Red-orange poppies like yours are the best colors! Really fun, pretty look with the orange red colour combination, like the background, unusual & eye catching. This bright and beautiful card cheers me up! That bright red poppy color is so gorgeous it's JUICY! WOW! Love this bold design! Love how you mixed your ink sprays and also used metallic ink to finish! The color of the poppies is so vibrant! Thanks for sharing your creativity with everyone! I love the way you used the stencil in the background! This BAF release is maybe my favorite yet - stunning card! This is the color I think of when poppies are mentioned. Love the color and love that stencil in your background. Nicely done. I love your card, I love the colors you chose. I also think of poppies in the colors you chose. Awesome! Thanks. I really love your work with this fabulous stamp set. What a wonderful card. Thank you. Fabulous card and the new flower set looks so cool! I absolutely love the way you came up with that beautiful poppy color. It is gorgeous!! The card is marvelous!! your creation is beautiful. i don't use the color orange alot, but your work is inspiring, makes me want to give it a try! Beautiful card! Love the bright red color. I love the background! You used a newly released stencil. Your flowers look great! Very pretty card! 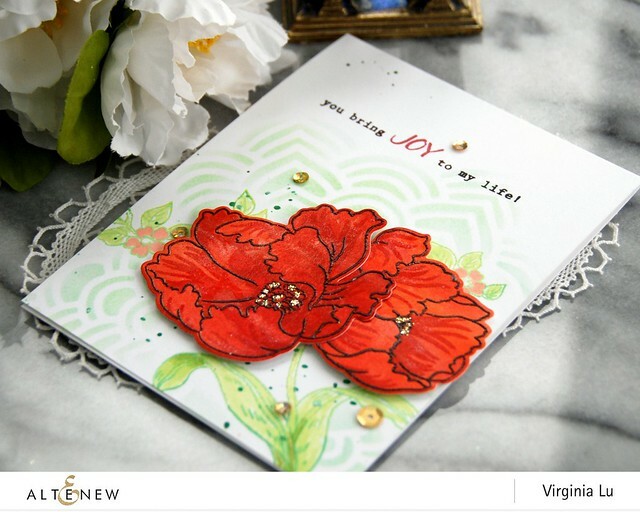 I love how you used the Mandala stencil for your background and the pretty colors you chose for your poppies. Gorgeous card that anyone would be happy to receive! Thanks for sharing. Holy moly, this has been a busy week for you! Happy crafty birthday, indeed. I love the subtle greenery behind your flowers; it's not only a nice color contrast, but a nice soft place to rest one's eyes from the bold blooms. You always have such lovely idea. Thanks for sharing and happy birthday month! I LOVE this card! The layout of the card with the beautiful red blooms made it look like you picked a real poppy and put it on the card! Absolutely beautiful! blending produced a gorgeous red for the focal point! Beautiful set, gorgeous background and layout! Love! So beautiful!! Your flowers are so vibrant! This card is gorgeous, you captured the orange-red of the poppies perfectly. Beautiful card Virginia and I love the background you created for this beautiful flower. Wow! Beautiful colors and beautiful layouts. I love the gorgeous poppies. Love the stencil you used on the second card. Both cards are Beautiful! Beautiful Poppies card! I love the idea of using the ink sprays as the "solid" stamp layer,brilliant AND beautiful! Happy Birthday from one December birthday girl to another. Love the background for this pretty poppy. Beautiful card. The poppies are so vibrant against the background. This card is beautiful. Your subtle background contrasts so perfectly with the rich reds of the poppy. Great card! Truly a beautiful new stamp set--lovely card, Virginia! Beautiful card! I love the dimension you added to the flowers and the bright colors. I really love your card. It is beautiful. This stamp and die set look like real fun to use. Beautiful card. Love the new BAF set. The bright red flowers look gorgeous. And I love the stencilled background. The subtle background really makes the red poppies stand out! Your cards are always so beautiful and cheery! especially enjoying this hop seeing all the inspiration using my favorite flower! And this is my favorite color of poppy-gorgeous card! Loving how you decided to use this set. And the stenciled background is perfect on this card. Love your card! This has got to be my favorite stamp set of all! Possibly because it's my favorite flower?! Using the mandela stencil is a perfect background. Thank you for the idea! Love those bold, red poppies!! Gorgeous. Lovely work, Virginia! Wow, what a striking card! Your gorgeous and vibrant poppies just pop right off of the lovely soft background. Such a pretty new floral! I love the soft stenciling in the background! Ohhhh I love how you layered the poppies and popped the blooms up to add dimension. That card looks absolutely gorgeous! Thank you for sharing.